The ISO/IEC 17025:2017 is a revised standard for accreditation of testing and calibration laboratories. The new version of ISO/IEC 17025 was released in 2017 by the ISO and laboratories have 3 years' time to upgrade their existing system. To achieve ISO/IEC 17025:2017 certification, organizations must have to implement quality management system in their calibration/testing laboratories and prepare documents that define the implemented system. We are offering online ISO 17025:2017 documentation consultancy, in which we collect required information from clients via e-mail and other digital resources and prepare documents accordingly by using our documentation toolkit. We also provide them online training that helps them to learn ISO/IEC 17025:2017 document requirements, and saves their lots of time in documentation. 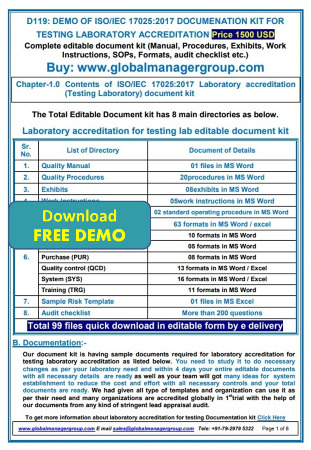 The ready-to-use ISO/IEC 17025:2017 documents for testing and calibration laboratories include sample copy of quality manual drafted and endorsed to ensure effective laboratory management system, mandatory procedures, SOPs, sample formats as well as ready-to-use ISO 17025 audit checklists, etc., in editable word formats. The complete set of readymade documents applies to both small and large size laboratories. The key benefit of using such readymade documents is that they save time and cost in the process of documentation, and hence, certification. Such ISO 17025 documents are designed under guidance of experienced ISO consultant, and therefore, reduce repetitive work and provide accurate documented information. Our ISO/IEC 17025:2017 Training ppt presentation will guide users to learn requirements of Laboratory accreditation system and ISO/IEC 17025:2017 standard in day-to-day process. It helps to review macro-level survey of the implemented system for how each requirements of standard is implemented in the testing or calibration laboratory. 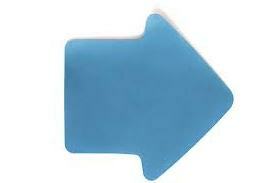 Readymade documents guide you on how to write quality manual and procedures for each department. It increases your team's confidence and accelerates organization towards achieving ISO certification with proper implementation and getting the benefits of continuous improvement.